This model is the Jordan & Lewden (River Series) Car Carrier Lorry in Dark Green and Yellow. This item has been "assembled" from two different models, I believe, as the wear and tear on the carrier component is significantly greater than that on the main body and rear tray castings. The four tiny cars are missing. 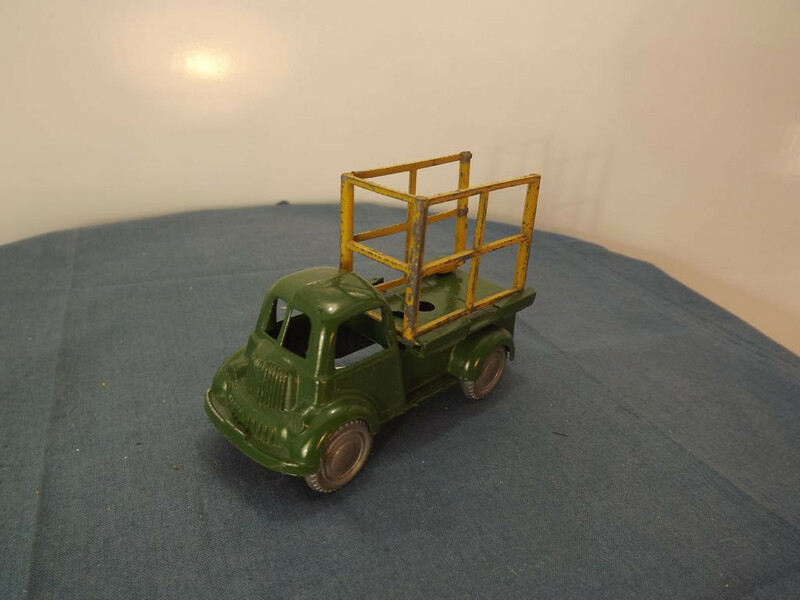 This simplistic casting is of a forward control lorry with detail cast into the body including the grille, the doors and handles, the body lines, front bumper and headlights. This is the first body casting with 10 lines cast into the lower grille area. 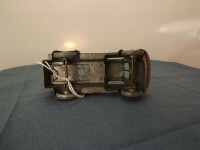 The casting is in three parts, the main body and cab casting, the rear tray casting, and the rear car carrier casting which slides into the rear tray to complete the model body. 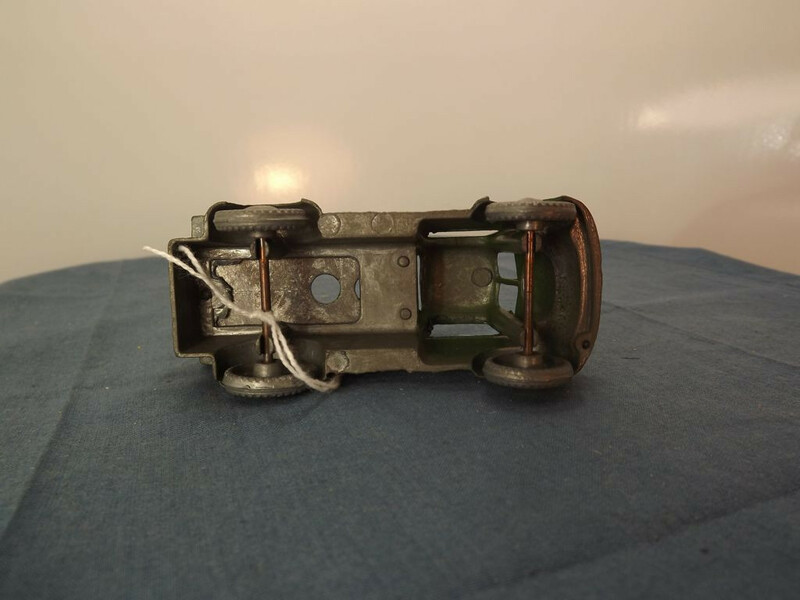 This car carrier casting is broken — the three rear horizontal struts are broken out of the carrier frame. I have distinguished it from the farm lorry (which had a hinged tailgate) by the design of the rear frame — this item is separated into four distinct sections to carry the four tiny cars, whereas the farm lorry frame has no centre vertical bar and the sides have only two sections. There is no baseplate. 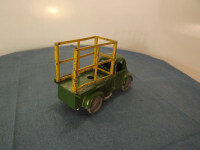 The under side of the cab roof is NOT marked "Made in England" on two lines as on other examples of this casting which would make it one of the very early castings. It devoid of all other marking or casting detail apart from the pillars that hold the axles in place. At the rear three cast metal rivets hold the rear body tray in place. All wheels comprise a single piece, solid metal hub and tyre shape. They are attached to the steel axles which have been pressure fitted to the wheels. The cast pillars are pinch crimped to hold the axles in place. This model was issued in the 1950s, possible circa 1953.